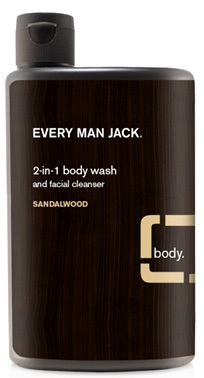 2-in-1 Body Wash, Sandalwood 13.5 fl oz (Every Man Jack) - Penn Herb Co. Ltd. Remove deep-down dirt and oil, leaving skin fresh, clean, and hydrated. Coconut-derived surfactants gently cleanse while glycerin helps retain skin’s moisture. A light fragrance refreshes. Designed for all skin types, including sensitive. Rinse face and body. Work into a rich lather. Apply to body and gently massage into wet face, then rinse completely.